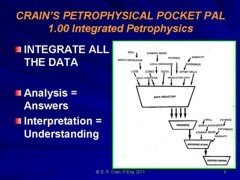 Publication History: This article was written especially for "Crain's Petrophysical Handbook" by E. R. Crain, P.Eng in 2007.,This webpage version is the copyrighted intellectual property of the author. All log analysis results need to be calibrated to any available "ground truth", such as core data, sample descriptions, and other lab data. Not all ground truth is quantitative, so a bit of judgment may be required. Other forms of calibration data are very accurate, but the results may apply to a tiny volume of rock. Upscaling to the log analysis volume also requires some careful thought, and possible some statistical smoothing of the fine scale data. Not all ground truth is "true", due to cavings from uphole, lag time errors, depth discrepancies, and other sampling anomalies. One measure of a good log analysis is that results should match ground truth reasonably well. In the case of shale volume calculations, ground truth is usually rather sparse and, if present, may be qualitative instead of quantitative. Sample descriptions are available on many wells. These will contain a written description of the rock chips extracted from the drilling mud. The description will include dominant mineralogy, accessory minerals, cementing minerals, grain size or texture, pore geometry, porosity estimate, and hydrocarbon shows. Shale or clay, if present, will be mentioned, sometimes with a volumetric estimate in percent. This work is done by observation through a microscope. Samples can be re-logged quantitatively after the initial review. Samples are well mixed by the mud circulation so these descriptions include rock chips from a fairly large interval. In addition, cavings from above the sampled interval will continue to contaminate deeper samples. Samples also take a long time to reach the surface, so their source depth is not perfectly established. The time taken to reach the surface is called the lag time. Lag time is calculated by comparing estimated borehole volume with mud pump capacity and speed. It is checked periodically by adding a chemical tracer to the mud and measuring how long it takes to detect the tracer back at the surface. A good wellsite geologist will correlate his description to the shape of the drilling time log. Later, the sample depths may be adjusted to the open hole logs, especially gamma ray, resistivity and density logs. The geologist will also eliminate most caving from the descriptions. Your log analysis should show 80 to 100% shale where the geologist shows “shale” or “mudtstone”. The results should show 0 to 10% shale where the samples indicate clean sandstone, limestone, dolomite, anhydrite, salt, or mixtures of these minerals. Some shale should show on your analysis where the samples contain shale or clay minerals. A precise match is probably impossible due to the inherent limitations of sample descriptions. At least the samples will eliminate calculation of shale when in fact the zone is a radioactive sandstone or dolomite. Core descriptions have a better chance of being on depth with the logs and can contain more detail than sample descriptions, especially in thinly bedded formations. The core may demonstrate more detail than the log resolution can follow, so you should try matching to average data over a 2 or 3 foot interval. 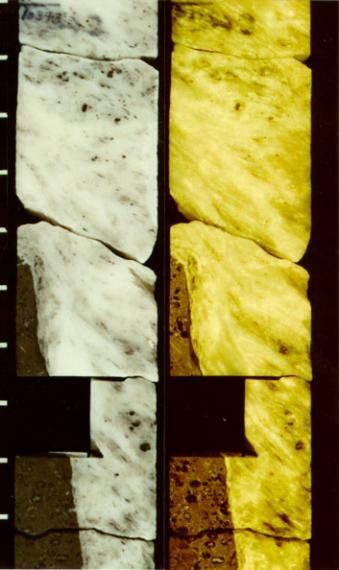 Photo-micrographs of sample chips or portions cut from cores can be interpreted by a petrologist. Results are usually written descriptions with considerable detail. Some can be quantitative. Thin section photographs are made by first injecting a coloured resin into the pores, then slicing and polishing. By passing light through the thin section, particular minerals can be identified by their colour and crystal structure. These can be tabulated numerically and are called thin section point counts. Clays and shales are easily identified as to quantity and type. One petrological term can be confusing to log analysts. The word “matrix” is used to describe fine-grained minerals (often clays) surrounded and between larger mineral grains. Log analysts use the term “matrix” to mean all the minerals that make up the rock, excluding shale and pore space. X-Ray diffraction data contains very detailed information on the mineralogy of rock samples. The samples can be very small, so obtaining a representative analysis requires a little care. The data set can be scrutinized to sum up the total fraction of clay minerals compared to the total of non- clay minerals. In this example, clay volume of the dry samples ranges between 35 and 53%. Porosity and clay bound water need to be added back, based on assumptions derived from log data in clean sands and pure shales, or on compaction trend lines. If porosity and clay bound water are approximately equal, the shale volume is equal to the clay volume in the table, and no further manipulation is needed.